This week is lesson 4 in the Life of David Series. Saul 'talks' the men into fighting the Ammonites. They are victorious and they go to Gilgal where Saul is crowned the first king of Israel. Last week we learned about Saul being anointed the first king. He was looking for his father’s lost donkeys and after looking for them for three days, his servant suggested they go see the prophet Samuel. God had told Samuel that the king He has chosen would come to Samuel. So, Samuel knew who Saul was and that he would be the king. Saul was anointed king. Nahash was an Ammonite and he went to Jabesh Gilead. Nahash wanted to take over Jabesh Gilead and the elders there made an agreement with him. They asked for seven days to send messengers out into their land to find people that would come fight for them. Nahash agreed and if they didn’t, they would become his servants. The messengers arrived at Gibeah where Saul was. They told the news to the people. The people were very upset and they shouted and cried. Saul was coming in from the field behind his herd and asked why the people were upset and crying. They told Saul about Nahash and Jabesh Gilead. This made Saul very angry when he heard this news! Saul cut up his yoke of oxen into pieces and sent them by messengers out to all the territories of Israel. Saul told them that this would happen to their oxen to whoever didn’t go fight with Saul in the battle. The people were afraid and they went to Saul to fight. When Saul counted them, there were 300,000 men of Israel and 30,000 men of Judah! They sent messengers to the men of Jabesh Gilead that they would have help the next day. They were very happy to know help was coming. Then, the men of Jabesh Gilead told Nahash that they would come to him the next day. Saul and his men killed the Ammonites until the afternoon when it was hot. It scattered the Ammonites that survived so much that there wasn’t two left together! There were some that didn’t want Saul to be the king. But now with this victory that Saul implemented, the men that wanted Saul king wanted to kill the ones that didn’t want Saul to be the king. But, Saul said no, that God accomplished salvation for His people today. 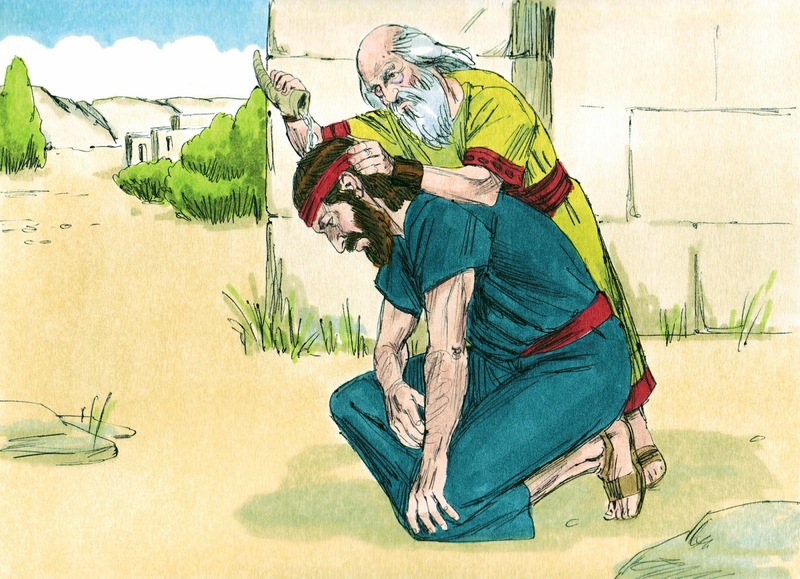 Samuel told the people to go to Gilgal. All the people went to Gilgal and Saul was made king there. Everyone was happy and they celebrated. Samuel told the people of Israel that he listened to them and gave them a new king. He reminded them that God had delivered the people from Egypt and they wanted a king. But, God was their king. Read 1 Samuel 12:14 Samuel reminded them to fear the LORD. Serve Him. Obey His voice. Do not rebel against His commandments. Both the people and the king need to obey God; but if you don’t, then God will be against you. Samuel asked God to send thunder and rain that day. God sent the thunder and rain to prove His power and the people were very afraid of God and Samuel. Read 1 Samuel 12:24 again. The people were told to fear the Lord and serve Him in truth. Consider the great things He has done for you. All these things that Samuel told the people are good reminders for us today. The printables for David in this series are for an older age group than I usually post. Most of these lessons about David are not appropriate for early elementary. But David is a great study. So, as you can see from the above picture, there is a Q&A. This could be used with younger groups by using the answer sheet and just asking the questions for discussion. Each post in this series will have a maze and some type of puzzle. The additional application has thought questions about how the students can apply the lesson to their daily life. There are answer sheets for all worksheets except for the last application. Everyone will have a different set of answers. Click here to download. so I used what I thought looked appropriate.